Clothing is a language. The garments one chooses are a personal vision and a public message. Hats and shoes are fashionable punctuation, finishing an outfit with individual flair. Whether updating last year’s dress or purchased for a special occasion, accessories are directly connected to important moments and memories. They are part of our life story. Dress—meaning the variety of body coverings humans wear every day—is both public and personal. Defining dress relies on two key concepts: fashion and style. Fashion is a cultural force. Style is a personal choice. To fashion is to make. To style is to manipulate and present. This exhibition invites viewers to experience hats and shoes from multiple perspectives. New England was a center of American industrialization in the nineteenth century, known especially for its world-famous textile mills in Lowell, Massachusetts. In addition, millions of shoes, boots, slippers, bonnets, caps, and straw hats left the factories in Haverhill, Amesbury, and Lynn, Massachusetts, as well as dozens of other towns throughout the region. Small-scale production by homeworkers and boutique designers also contributed piecework and finished garments to consumers. New England entrepreneurial spirit imbued the hat and shoe industries. Julia A. Adams, who assembled this group of straw braiding samples, worked in a Medway, Massachusetts bonnet factory, most likely the Metcalf factory. Begun in 1842, the Metcalf factory was one of the largest employers in town and part of a regional economy that employed more women in the early to mid-nineteenth century in Massachusetts than textile or shoe production. Many authors over the years have attributed the origins of New England straw bonnet manufacturing to a single woman, Bestey Metcalf, sometimes misidentified as Hannah. The story revolves around an imported Italian “Leghorn” hat Betsey saw in a window but could not afford. Made with fine straw bleached almost white, these beautiful accessories were far beyond Betsey’s modest pocketbook, so the enterprising young woman decided to make her own bonnet with local rye straw. Numerous interviews, letters, and details about Betsey seem to confirm aspects of this story. Miss Metcalf appears to have taught herself to braid, and encouraged her friends as well. But whether rye straw hats developed from the nimble fingers of a single inventor is less important than the impact domestic bonnet production had on the regional economy. Beginning in the 1820s and 1830s over forty-eight percent of women who worked were employed in the production of straw and palm-leaf hats. 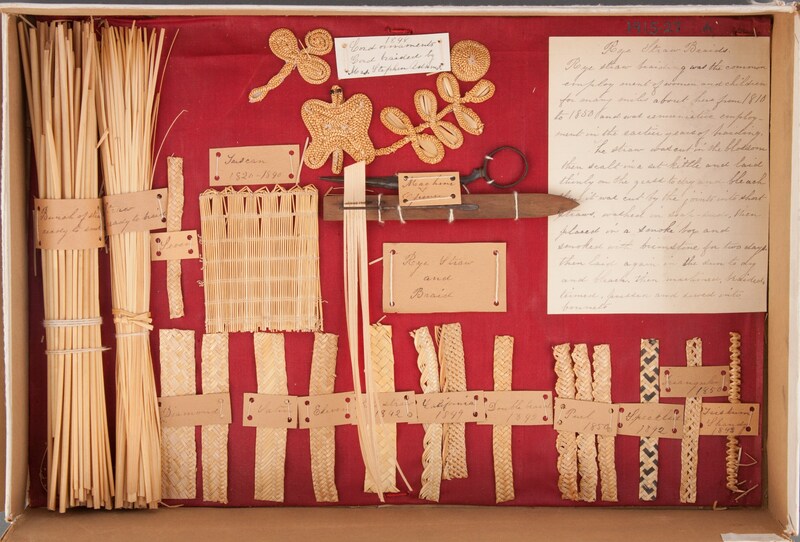 Straw braiding paid half as much as textile or shoe factory labor, but it remained a consistent source of income and independence for many women in New England throughout the nineteenth century. Workers picked up raw materials from their local dry good merchant and braided lengths of split rye straw at home. They were typically paid by the foot of completed braid returned to the merchant, who then sold it to specialist milliners for making up into hats. Quite often straw braiders worked for the same stores where they shopped for their families. Later in the 1850s the first “factories” concentrated that portion of straw hat production under one roof, but they still relied on rural outwork in the region for braid production. 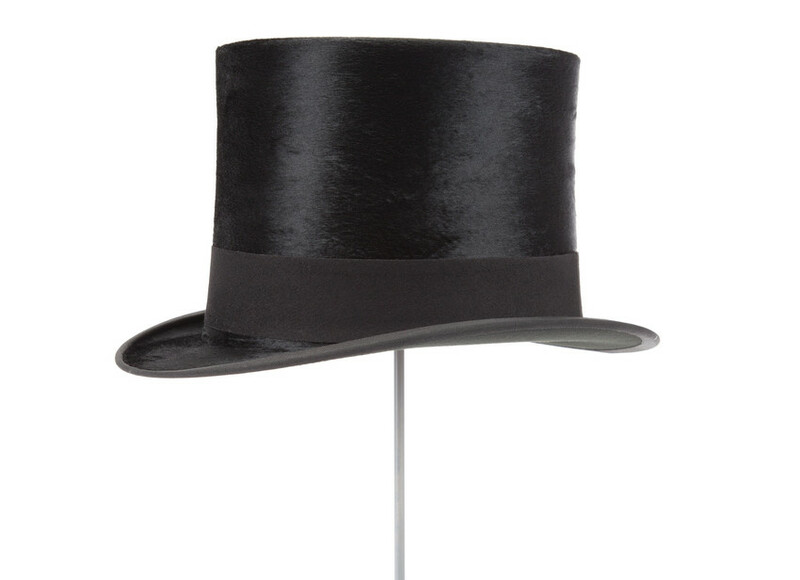 Only the largest factories were vertically integrated and could take rye straw from raw product to finished hat. These shoes are most likely Martha Stevens’s wedding shoes. Unfortunately little information remains about Martha specifically other than her generous donations to charity and family upon her death, but she married John Stevens and resided in Ashford, Connecticut. The shoes were special enough to bequeath to her relative and the executor of her will, Increase Sumner. His son, General William H. Sumner, in turn gave the shoes to the Massachusetts Historical Society in 1872. 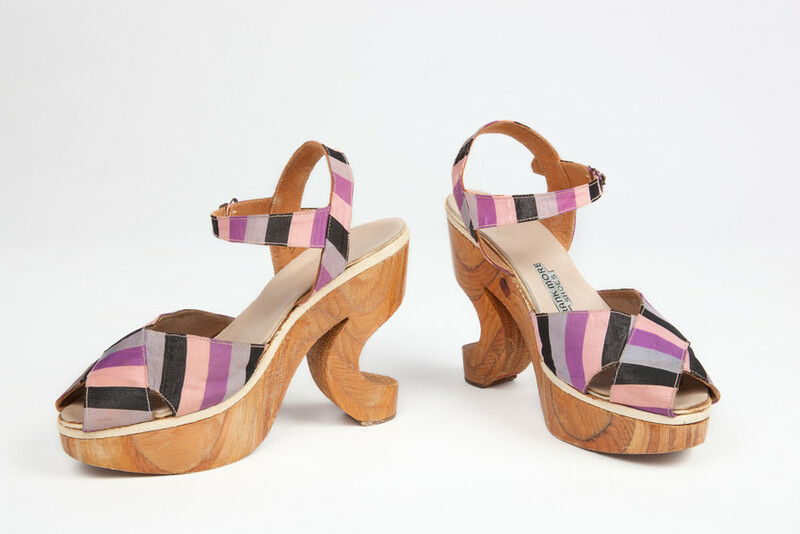 The shoes received special mention in the Stoddard family history, where author Elijah Stoddard noted “a family relic of Mrs. Stevens, a pair of old-fashioned high-heeled shoes, of rich material” in the Sumner family. 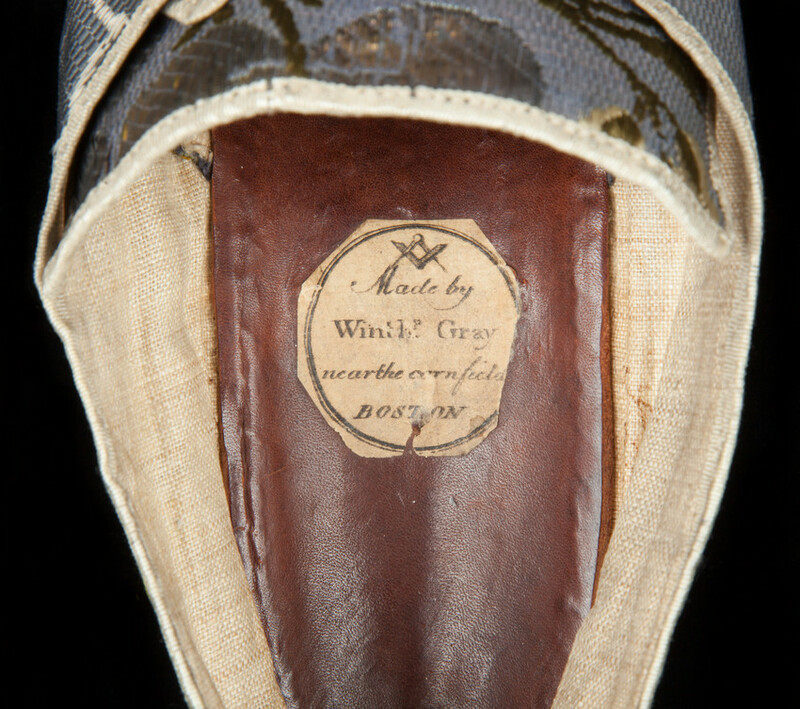 Winthrop Gray, from a family of Lynn, Massachusetts cordwainers, moved to Boston to set up his shoemaking business. He placed his shop near a local tavern, the Cornfield, which in 1763 was on Union Street. Only in business for a few years, Gray went on to serve as a Captain in the Continental Army from 1776 to 1779 then in 1781 as inn holder of the American Exchange Tavern on State Street in Boston. At only age 43, Gray died the following year. Significant innovations in the nineteenth century, such as flexible, watertight footwear, patented arch supports, and substitutes for expensive imported straw bonnets, changed New England’s fashion landscape. Innovators built on existing expertise and technology, creating new materials, designs, and concepts. The man responsible for everything from rubber boots to bicycle tires began by mixing chemicals in his family’s porcelain teacups. 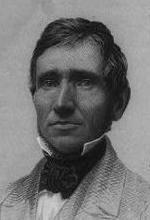 Convinced that he could find a way to keep rubber from melting in summer and cracking in winter, Charles Goodyear spent years trying to perfect the formula before he stumbled on adding sulfur to heated rubber. By 1844, patent in hand, Goodyear licensed the formula to several companies in the burgeoning rubber town of Naugatuck, Connecticut. Unfortunately, Goodyear spent his money as soon as he earned it, fighting numerous patent infringements in court. Goodyear’s legacy is most visible in the company named in his honor, based in Akron, Ohio and in the millions of sneakers, tires, and other rubber-based products still on the market today. 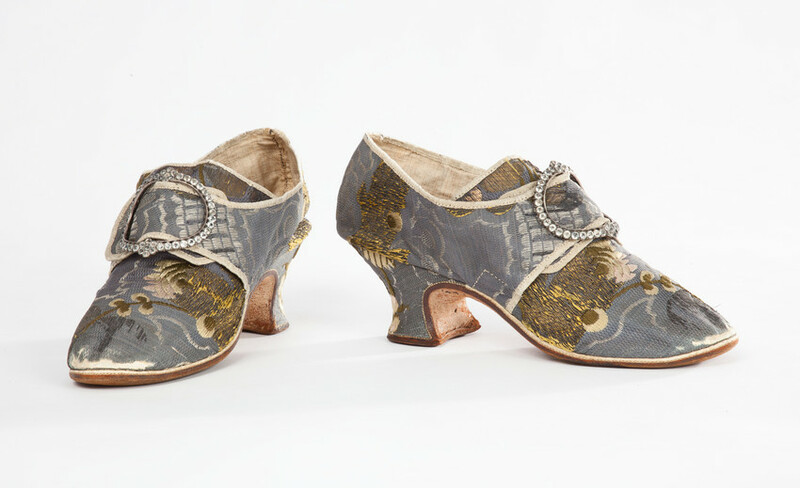 This pair in the exhibition were made by the Wales Goodyear Shoe Company, manufacturer (in business 1845-1916) in Naugatuck, Connecticut, around 1880-1900. 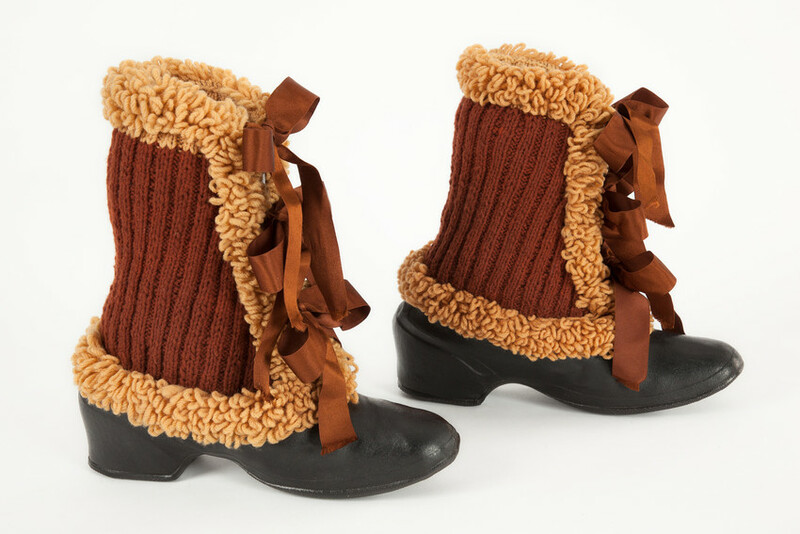 The donor’s mother knit the tops to wear on winter carriage rides in the late 19th century. Stylish women and men have a sense about how to tell their personal stories with clothing. Designer Bill Blass called it, “a matter of instinct.” Style applies equally to the designer, whose creations embody her or his vision against a backdrop of social trends, current events, and the larger historical narrative. Gabrielle “Coco” Chanel, founder of one of the world’s most iconic fashion brands, once said, “Fashion fades, only style remains the same.” If clothing is a language, then style is an individual’s poem or essay, sentence or exclamation point. Dressing up to go out—whether calling for tea or dancing at a disco—required accessories with particular flair. 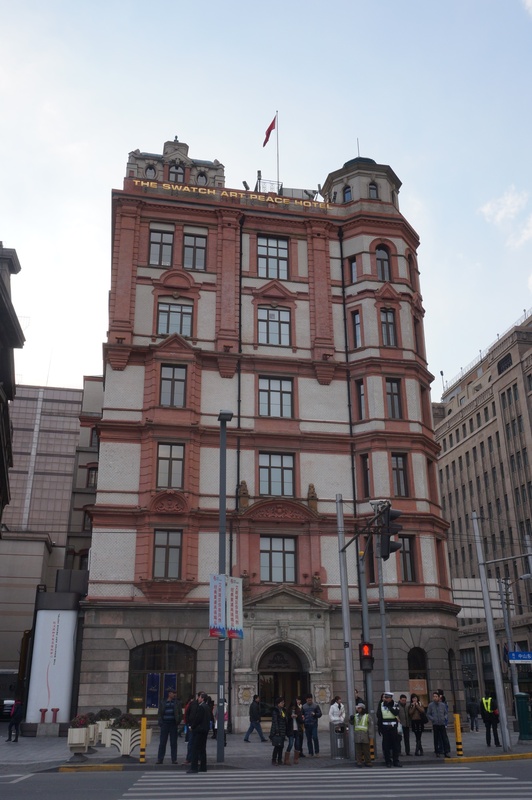 Palace Hotel on The Bund in Shanghai. Now known as the Swatch Art Peace Hotel. Textile factory executive Walter Hinckley Bradley began his career on the factory floor in the Wamsutta mills, working his way up to Superintendent of the mill in Androscoggin, Maine. In 1916, while employed at the Pepperell Manufacturing Company, Bradley traveled to Japan and China as a consultant for the Boston industrial engineering firm Lockwood, Greene & Co. The firm worked with Bradley to build and equip a large mill for the Yu Yuen Textile Company in Tientsin, China. The firm later used images of the mill in their 1918 advertising campaign, noting their use of the latest technology. Bradley’s 1916 passport extension lists his address as the Palace Hotel, Shanghai, China. 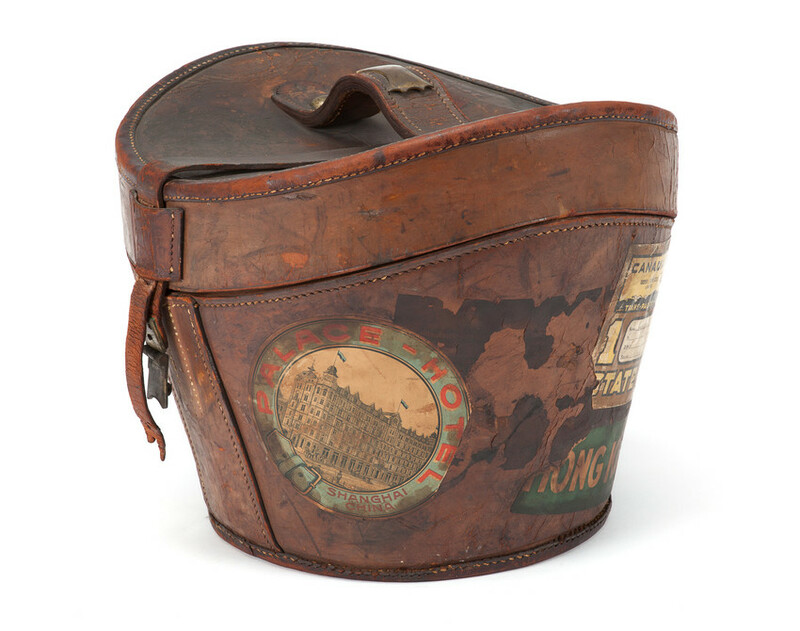 Walter definitely needed to have his best top hat with him on such an important business trip, so it is no surprise that a large decal from the Palace Hotel appears on the custom traveling case made for his hat. Although he was working until at least 1916 Mr. Bradley served in the Navy by the end of the First World War, mustering out in 1919. In 1925 he married YMCA worker Florence Royer, whose hat is in the Work section of the exhibition. The opposite of glamorous dancing shoes or elegant church attire, work wear is functional and durable. For many New Englanders, going to worship services means putting on your best clothes, a special hat, and shining your shoes. For some, it also involves serious investment in fashionable labels and the latest trends. Shape, materials, and even colors of hats and shoes are often understood as gender specific. Those connections—high heels and femininity, for example—have changed over time. Once worn by cavalry men and nobility, high heels were gradually adopted by both genders. Perception of gender and clothing can also be intentionally misconstrued, altered, or subverted by the wearer and the observer. Around the turn of the twentieth century women adopted straw hats previously worn by men, taking a gender-specific object and making it their own. The stylistic markers of gender have long been open to construction. For centuries Western designers and tourists have voraciously consumed ideas, images, and entire costumes from other cultures. 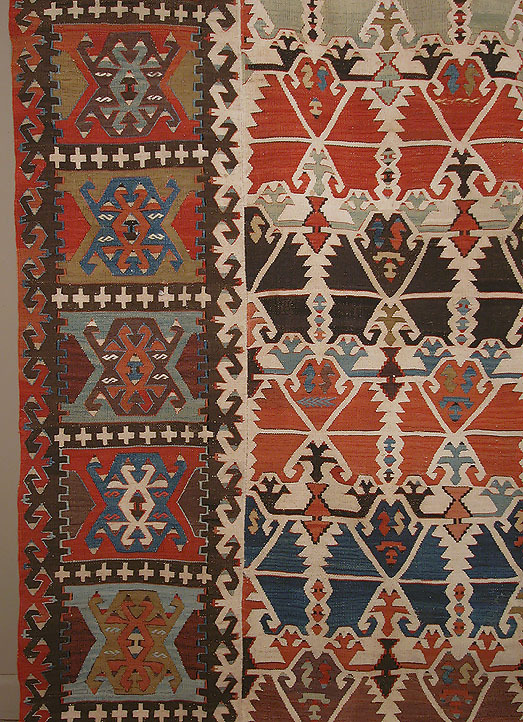 Until recently, most of the designs, techniques, and textiles were used without any acknowledgement of their meaning and importance. At the other end of the spectrum, many traditional artists maintained an important practice by making tourist souvenirs based on culturally significant art. The objects displayed here reflect those complex intersections of culture, art, and capital. 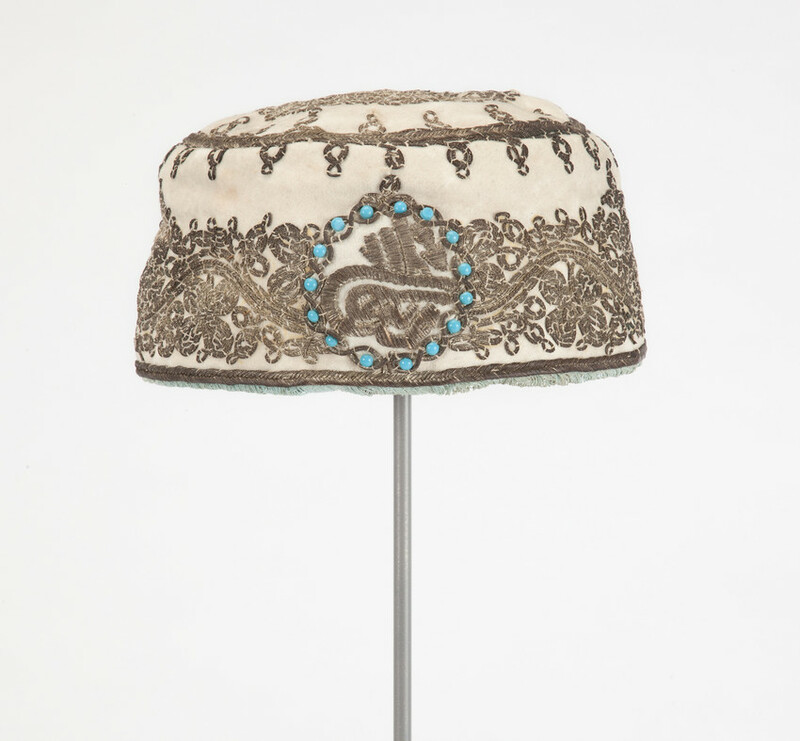 The elaborate central medallion of this felt kufi or taqiyah contains a special symbol. Officials in the Turkish Ottoman Empire used the swirling characters called a ‘tughra’ as a type of signature or official seal on objects, documents, and even buildings. All tughras include three vertical lines with two concentric loops placed on the left side, but court artists created unique variants for each succession. While the exact sultan to whom this tughra belongs remains unidentified, the symbol was meant to be immediately recognized as a court seal. The end of the Ottoman Empire in the early twentieth century also spelled the end of this beautiful graphic form. 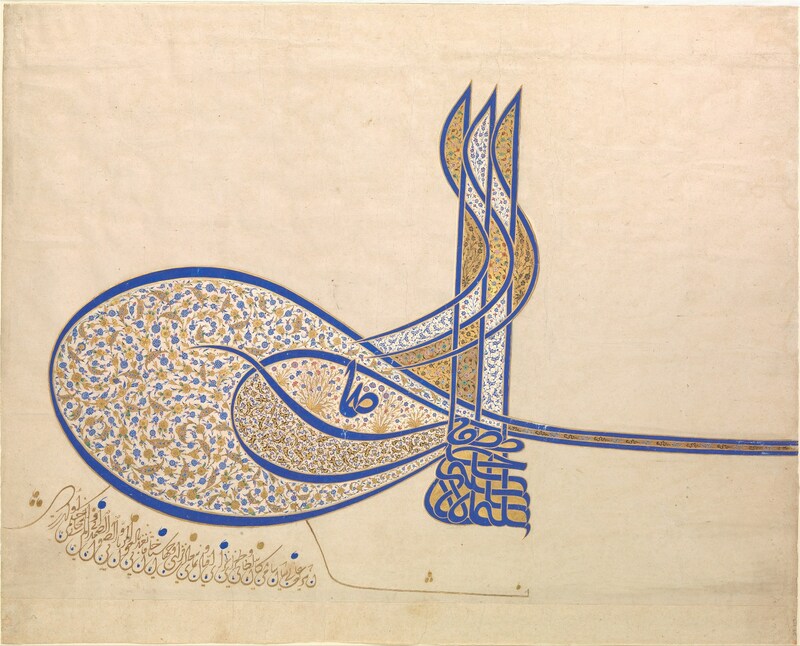 Decorated tughra of Süleyman the Magnificent (1520). Courtesy of Metropolitan Museum of Art. Shop windows filled with a tempting array of goods introduced Europeans and Americans to a new form of consumer culture in the early eighteenth century. Promenading down streets to view and purchase the latest items was called, “shopping.” While open markets continued to offer consumers alternatives for procuring goods, shops presented a heady combination of display and entertainment to entice customers. The textile used to make the uppers of these distinctive slippers is called “kilim.” A special form of tapestry weaving popular in Western Turkey, kilim is often used for rugs, hangings, and domestic textiles. At the end of the Crimean War (1853-56), fought to protect the rights of Christian minorities in the Holy Land and to block Russian territorial expansion, Turkey exported large amounts of kilims to its allies, especially to France and to Britain. 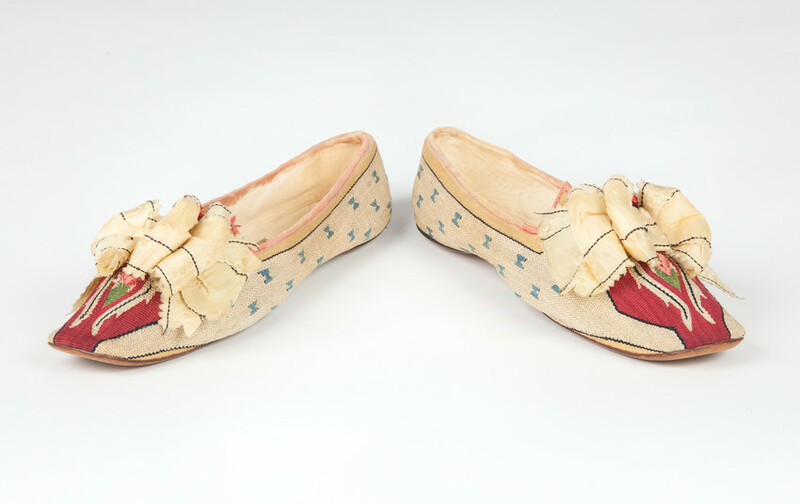 Parisian slipper makers used kilims to create distinctive and popular footwear. The United States made a ready market for these beautiful pieces. Sold at Thomas Moseley of Boston, c. 1855. The owner, reportedly pregnant and suffering the pinch of her fashionable shoes, slit the vamps (across the top of the foot) and hid the alteration with silk ribbons. Forming both the fabric and the embellishment of a hat, fur, and feathers and felt have never really gone out of fashion. But their very popularity caused great harm to the environment and the people who worked in the hat and shoe industries. Activism reflected in fashion and style can take many forms, from the formation of the Massachusetts Audubon Society in 1896 to a pink hat, one of thousands, knitted and worn at a 2017 protest march.